Gillian studied further at Sault Collage of Fine Arts, as well with many different teachers from Dundas Valley School of Art. Her subjects are taken from her garden, her life and the happenings in the world in general. 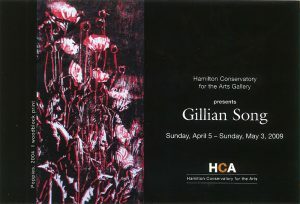 Gillian Song is a Burlington artist who works in painting and printmaking. She grew up in Wales and trained as a nurse in London, England. Although she has always had a lively interest in art, Gillian did not start painting seriously until after attending a summer art school in Northern Ontario.